Heavy duty for sturdy load support. Stacks securely and protects contents. Ideal for forgings, machine parts, stampings, ceramics and other hot parts emerging from molds or processing machines. Impervious to standard cutting oils, greases and solvents. Standard colors are Blue, Gray, Green, or White. Additional sizes and colors are available -- call for information. FOB Shipping Point. 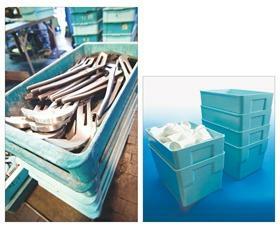 The material matters in material handling. Exceptional performance and durability from high strength, glass-reinforced composites. Dimensionally stable, will not bend or sag under loads. 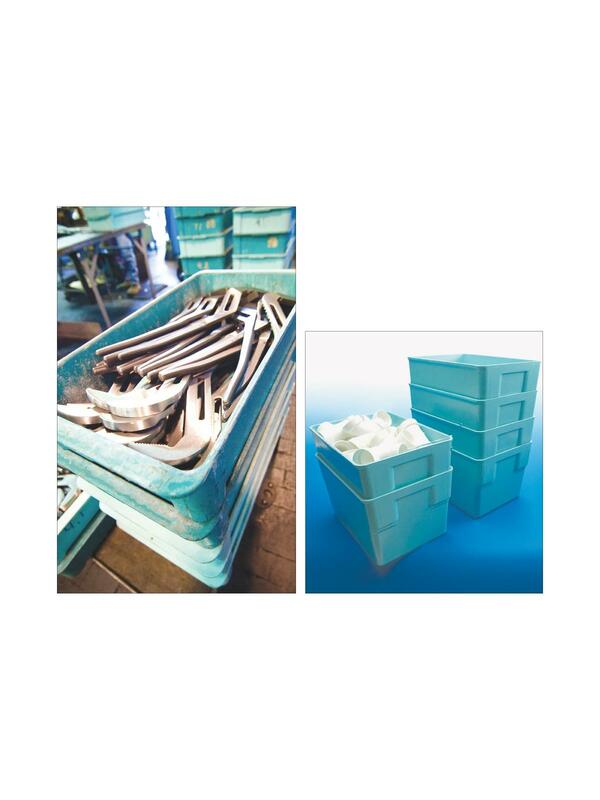 See Related Items tab for Stacking Container Lids. 18-7/8 x 9-1/2 x 3-1/4"18-7/8 9-1/2 3-1/4"
20-3/4 x 11-1/4 x 3-1/4"20-3/4 11-1/4 3-1/4"